Google Shopping Actions is an online marketplace that makes it extremely convenient for consumers to shop, by utilizing a universal shopping cart and instant checkout with saved payment information. For example, you can purchase a blender from Walmart and at the same time buy flowers from 1-800 Flowers. All items will be placed in a universal shopping cart and customers can pay for it using the credit card that is saved in their Google account. Advertisers have access to their orders, and are responsible for order fulfillment. Google Shopping Actions ad listings are reflected in the image below with the colorful parachute saying “Express”. 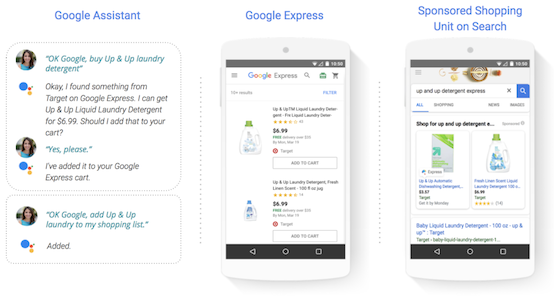 What makes Google Shopping Actions valuable for advertisers? 1) Advertisers can sell their products across multiple Google platforms like Google Search, Google Assistant, Google Home devices, and the Google Express mobile app. 2) Google Shopping Actions ease of use, through the checkout process, leads to fewer clicks and a higher conversion rate. 3) Google has made significant investments in machine learning and AI, leading to a tailor-made shopping experience, adding to higher conversion rates. 4) Enhancing the user experience creates a higher level of consumer loyalty, leading to repeat business. Step 1) The first step is to submit this interest form to Google. Step 2) Google will review your submission. 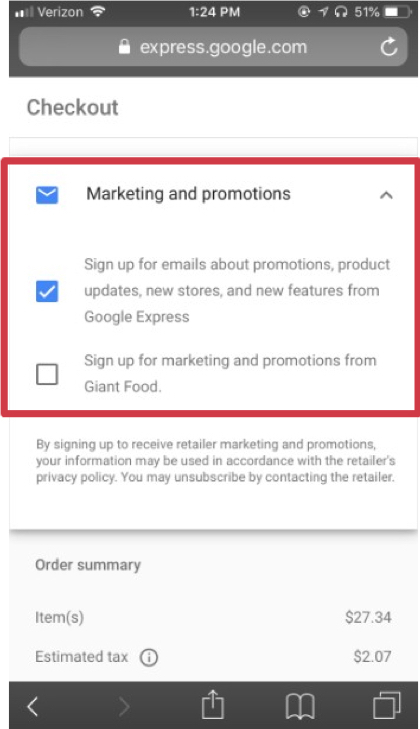 Step 3) Once approved there are settings under the Google Shopping Actions tab, found in your Google Merchant Center account that need to be completed, including accepting the terms of service. Step 4) Once everything is setup in Google Merchant Center, you will need to “request final validation” within the Google Shopping Actions section found in your Google merchant center account. Step 5) You will be notified by Google once your account is approved. 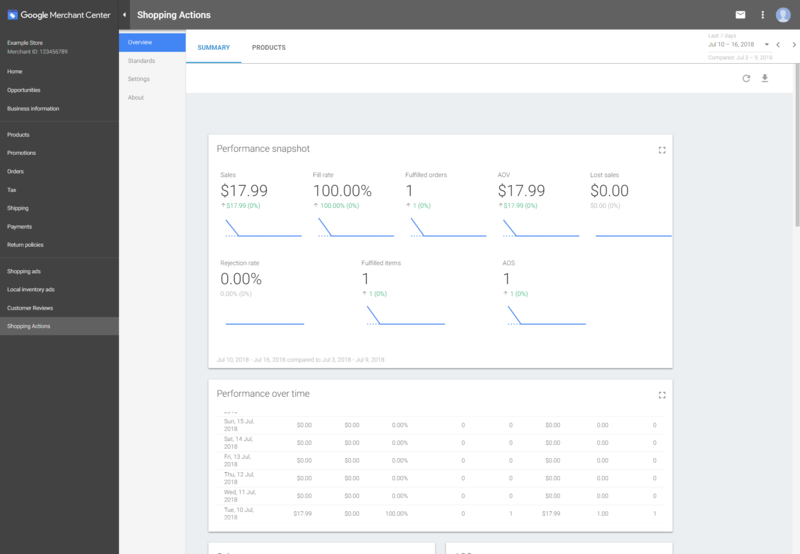 The Google Shopping Actions reporting interface includes ad score history, defect rates, sales, lost sales, order fulfillment rates, rejections, and much more. Google Shopping ads and text ads are charged on a cost per click model (CPC), however Google Shopping Actions is based on a cost per sale (CPA) model. Depending on the item category the commission rates range from 5-20% with an average of 12%. If you’d like to know your specific rate, please reach out to us for more information. 1) The quality and relevance of data feeds. 2) Accurate product category classification. 3) Consistent account activity. Example – being proactive labeling products around seasonal and sales events. 4) Timely and accurate order fulfillment. Quality score is updated on the first day of each month based on data from the past 90 days. Improving quality score should reduce commission rates. Several new metrics have been added to assist in performance tracking. 1) Unlike Amazon, customer data belongs to the advertiser and is easy to access. 3) Simple standards and processes to facilitate and manage returns. Future plans include local listing ads. There is also mention of customers being able to order online and pick up their orders from a store location. We anticipate many additional updates as more advertisers start using Googles new online marketplace. Feedonomics has been selected as one of a handful of Google Shopping Actions partners. With our intelligent platform and full service team we can assist you in getting your products listed. and partner with the largest channels and marketplaces. 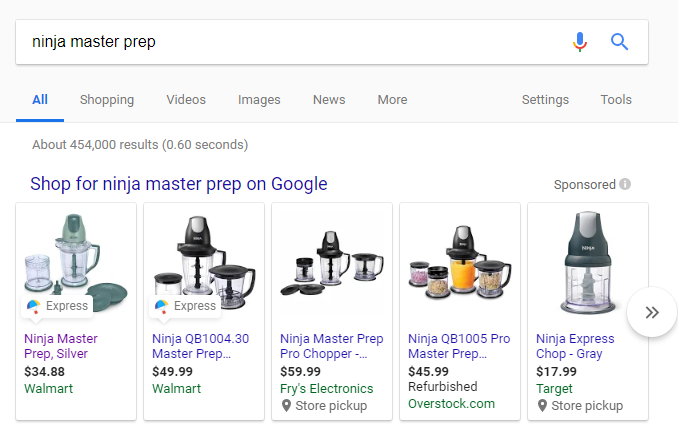 Want to learn more about Google Shopping Actions? This auto part client increases ROAS by 299% by optimizing their product feeds with Feedonomics. 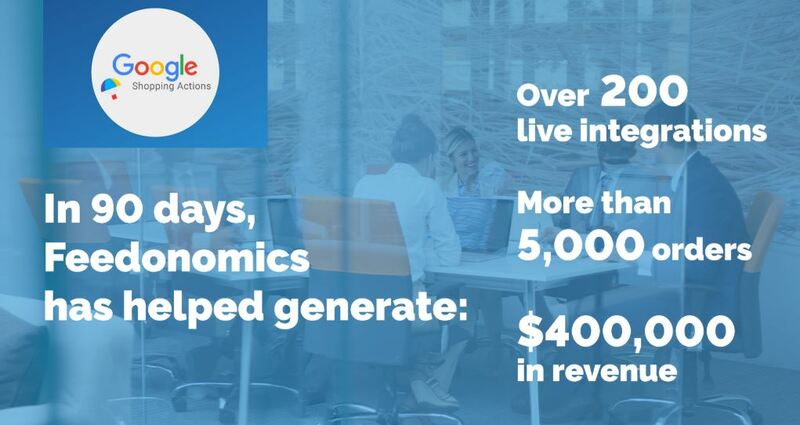 This agency client increases ROAS by an average of 184% across 29 clients using Feedonomics. This large scale flower client gets a 3.7x increase in online product sales by using Feedonomics. Feedonomics helps custom apparel and art client increase revenue by 229% for millions of SKUs.